These two photos are of a couple of unknown people – one of them with an unknown dog. Here’s the lad. The lad has been lifted off his background by shading out the edge. We have no idea who he is. And now the lady and dog. Here we have a fabulously sharp image although the dog may have a human thumb print across its face. Both images are carte de visite (CDV) size and both have the mark of Alf Burgess on the back. We think Alf used this style in his early days as a professional photographer – or maybe he ran out of his pre-printed cards. So not only are we unable to name the people, we are also unsure of the date. Any suggestions would be well received. These photos are in a Victorian album of photos of the Durnford family. Here we have a news item which has been sellotaped into an album (and thus damaged). This news item dates from 28th February 1952. The person who kept it hasn’t named the paper. It shows a wonderful toy found in the home of the late George Cull of Easterton. The toy represents a double decked horse drawn bus. The bus appears to be made of basket work. Whilst the age of the toy was uncertain, it had been found wrapped in an 1887 newspaper so it is assumed to be that old at least. Of course, back in 1952 we had no museum here in Lavington. As far as our museum is concerned we missed the bus and it got away. But now we have begun enquiries to find out if this lovely looking toy still exists. John Baker was a fine, upstanding Victorian gentleman living in Market Lavington. His day job was as a dealer and worker in ‘light’ metals and enamelled goods. Sometimes such workers were called Whitesmiths. His premises were immediately opposite what is now the Coop shop, just to the right of Woodland Yard. Many locals will remember this building being an ironmongers or hardware shop. John was very involved in many aspects of life in the parish, not least by being a sharp shooting member of the Loyal Volunteers. Our picture shows him in that guise. One of his descendants gave this description of this photo. John Baker in the full splendour of his Colour Sergeant uniform in the Wilt’s Militia. He was quite a famous “shot” and won many splendid trophies at such places as Bisley. Like his father he was also a whitesmith- that is a dealer in light metals – tin and enamelled goods. He had a forge in the market place and at time fulfilled orders for the armoury located on Salisbury Plain. He was secretary for the Parish Council and a collector of the parish rates. He also kept the parish church clock in repair, my mother having on several occasions gone up the tower with him when repairs were necessary. He was on ardent collector of fine books, furniture and artefacts, interests he shared with his favourite nephew Joseph Sainsbury. John was born in about 1844 and sadly, died rather young in 1903. Perhaps as a result several of his young adult children set off for new lives in Canada. The Baker family have remained very interested in their Market Lavington home and have donated many items to the museum. A couple of years ago we featured one seed pan on this blog. Today we look at three of them. They are all Victorian and all were made at the Lavington Brick, Tile and Pottery works on Broadway. They date from the era when the Box family were in charge there. Their purpose is really indicated by the name ‘seed pan’. They were for planting seeds in – the seed trays of their day. Mostly, these days, we use rather flimsy plastic seed trays which have a short life. They are typical of today’s throw-away society. These Victorian pans have done what they should. They have lasted a lifetime and more and whilst no longer pristine they could still do the job they were designed for. Clearly there were different shapes, sizes and depths to suit different seeds and locations. For those of us who like brick type products these are really lovely items. Back in Victorian times, the Loyal Volunteers were ready to serve their country as armed soldiers if need arose. They practised regularly and certainly had skills as marksmen. We have seen a couple of pictures of the men on this blog and also buttons found by a local metal detectorist. Loyal Volunteers were able to earn long service awards and today we show one such award. 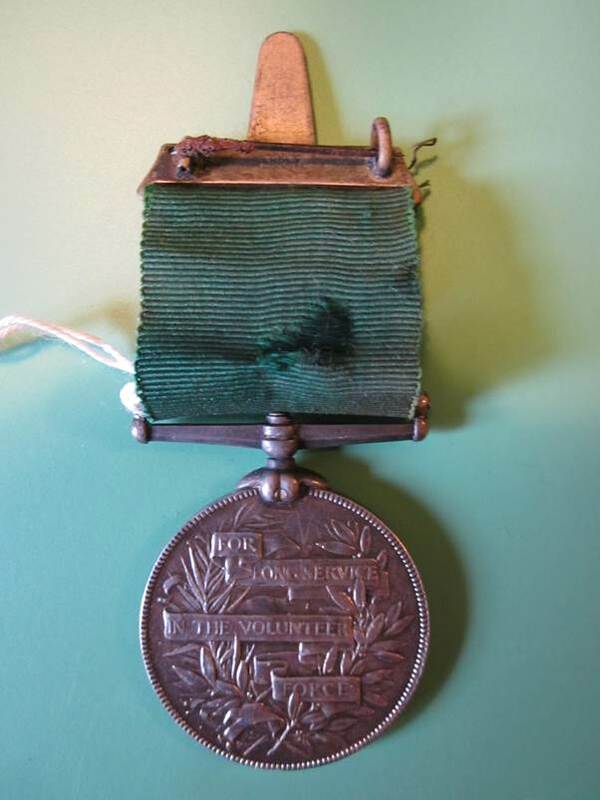 Nobody is named on this medal and we do not know who it belonged to. But many local men served lengthy periods in the Volunteer Force. 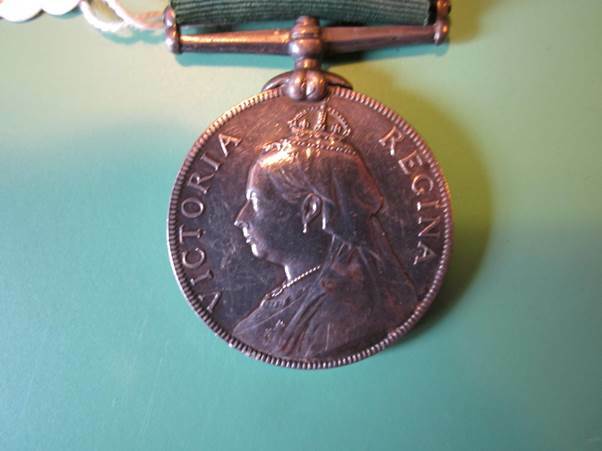 The other side has an image of Queen Victoria. This is a fairly elderly looking queen and that suggests the medal was awarded, perhaps in the 1880s or 1890s. It’s a lovely item but it would be good to know more about it. Advertise in the Wiltshire Times. This flyer was an attempt to solicit adverts to go into one of the local newspapers – The Wiltshire Times. It isn’t dated, but the list of agents with the average number of copies sold gives us a clue and provides the Market Lavington interest. Just one line of this applies to Market Lavington. Easterton does not appear to have a Wiltshire Times agent. We can see that Mr Whitchurch, the chemist sold an average of 42 copies of the paper each week. So where and when can we find Mr Whitchurch? We have his shop (just) on an Edwardian postcard. This is High Street in Market Lavington. 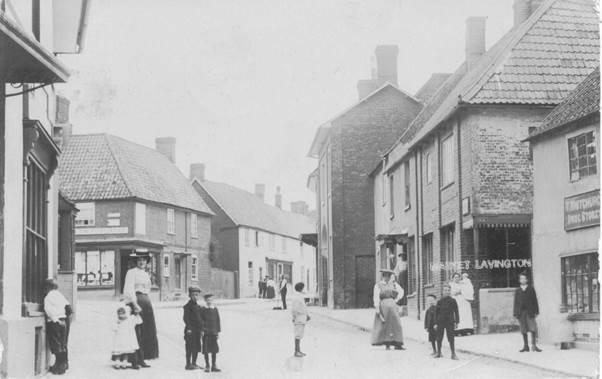 The present day chemist stands on the corner with Market Place, behind the lady in the dark skirt and straw boater – but this has nothing to do with Mr Whitchurch’s premises which are at the extreme right, next to Chapel Lane which is the path that leads down to the fish and chip/take away shop. We often call that property Kyte’s Cottage. If we enlarge the sign above the window we can just about read it. 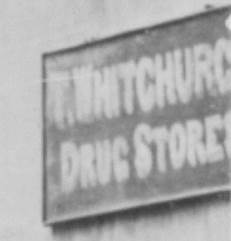 Mr Whitchurch had his drug stores there – and also sold the Wiltshire Times. 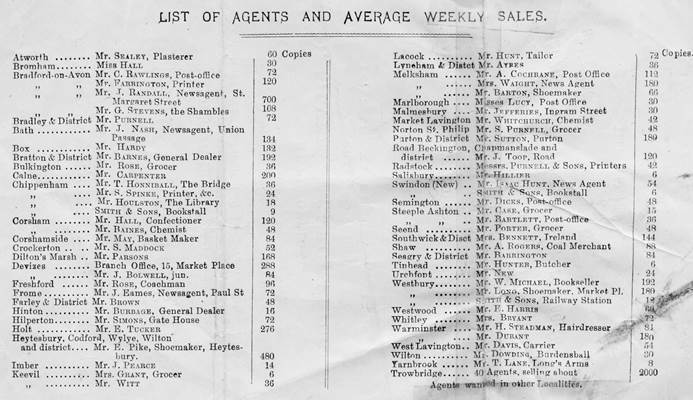 Or maybe his wife did, for on the 1891 census Thomas is listed as a druggist and his wife, Mary, as a news agent. Earlier censuses have Mary as a druggist’s wife. They had taken on the druggist business in about 1870 and were still running the two businesses in 1901. Thomas died in 1906. In 1911 Mary was still at the shop premises but the business of stationer and confectioner was being carried out by her daughter, Mrs Sheppard. 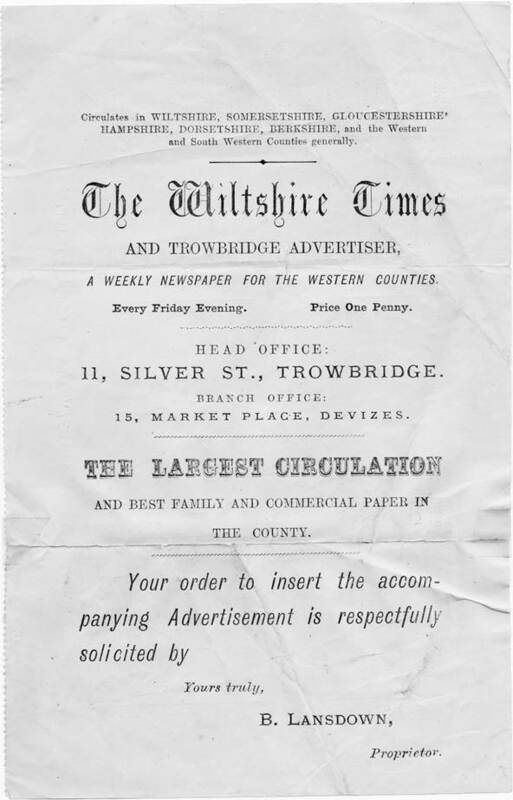 We date our Wiltshire Times flyer as between 1891 and 1906. Our kitchen range is a part of the structure of the museum. As such it forms a permanent display. 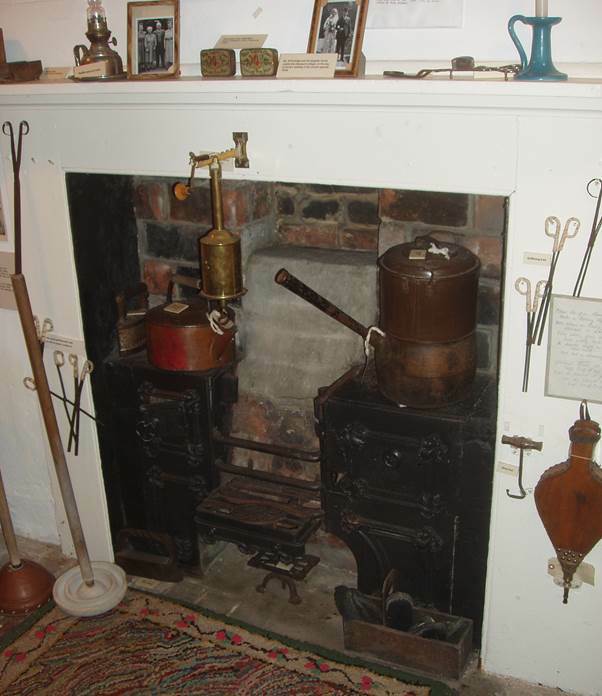 We believe it was installed when the cottage was built in the 1840s – and there it still is. Actually, it is not in good order, but is cosmetically OK and it certainly is a real feature of our kitchen display area. There we see it – a small, cottage sized range with rather huge saucepans on top. The range would have been in use in living memory for the Burbidge family lived there until the 1950s. We have more clutter around the range than would have been the case. On the mantle shelf we have appropriate photos of the Burbidge family along with lamps and a candle wick trimmer. There are also various tins and trinkets. The walls around the range have displays of items which may have been used in the kitchen area. This includes hair curlers – the house never had a bathroom. The rug in front of the stove is made from old rags. Nothing was wasted in the domestic economy of past times. It was used in Market Lavington before coming to the museum. Our museum reopens for 2015 on Saturday 2nd May at 2.30pm. You can come and see it for yourself then. We have quite an extensive collection of clothing and accessories at the museum but it is quite rare for new items of historic clothing to be given to us. This blog post is, in part, an appeal for more – of the right kind. But first the new item. It is a Victorian aged christening mantle and it belonged to the Williams family in Easterton and was certainly used as recently as the 1960s as well as in earlier times. This is a substantial item – big enough and heavy enough to keep a baby in place and warm enough. An overall view hides the detail. The mantle is heavily and intricately embroidered with plant motifs. 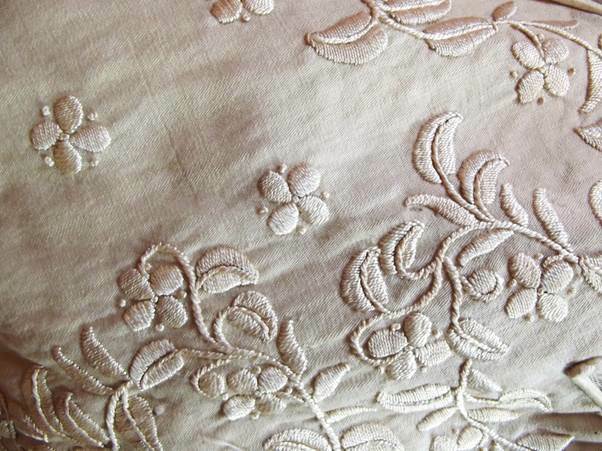 The member of the Williams family who passed this to the museum is an embroiderer by trade and he was able to assure us that this was machine embroidery. 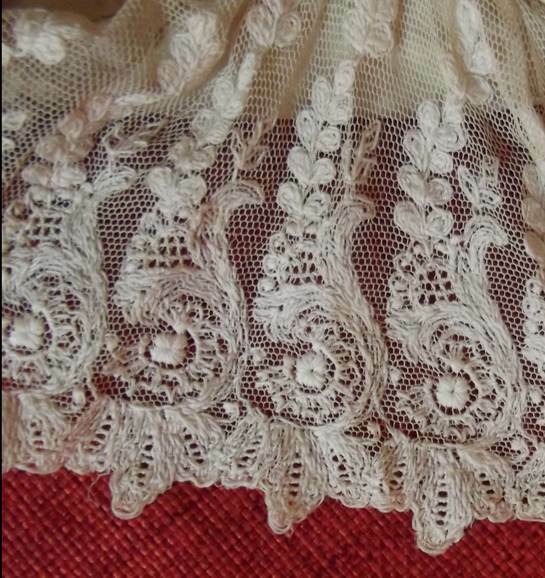 The mantle is trimmed with lace. This is also machine made. So there we have a lovely addition to our museum. And what kind of clothes might we like to have examples of at the museum? Well first and foremost they must have a real and definite link with Market Lavington or Easterton. We would value complete period outfits for adults and of course, the period could begin to be quite modern. We have nothing to truly represent the 1960s – and they were now 50 years ago. We can all be amused looking at those flared trousers of the 70s – in photographs. We have nothing from that era for real. 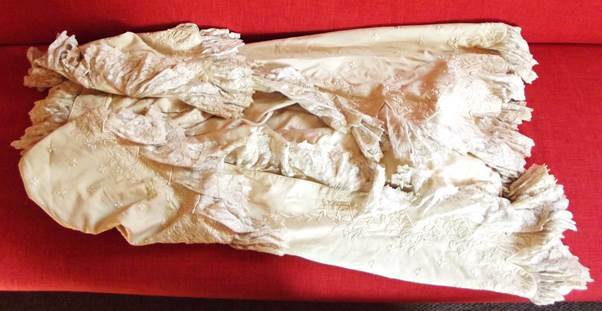 Really it is clothing from the last 100 years that would fill gaps in our collection – but please don’t all rush at once. These days we are 100% used to having light at the flick of a switch. Market Lavington has had mains electricity for long enough that the days before electric light are now before living memory here. More remote places in Britain were still being connected, for the first time, much more recently and there are still many remote places that do not have the supply. And that meant other forms of lighting. 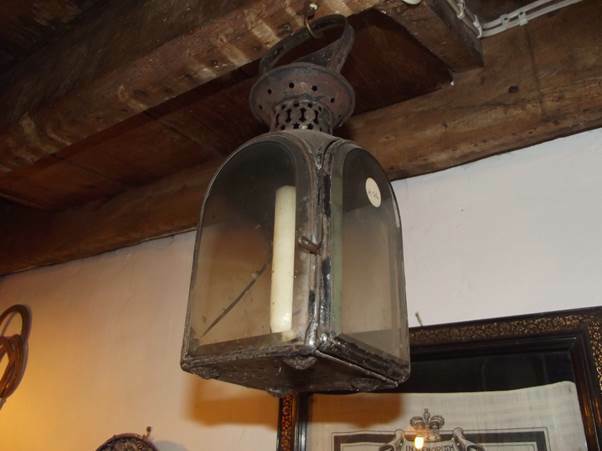 For centuries, the simple light was the candle but can you imagine the night time difficulties. Let’s imagine you need to get up to use the loo. In the pitch black you need to find candle and a method of lighting it. You have to struggle downstairs and out into the garden (for you had a privy at the bottom of your patch). You probably hoped for a clear sky and a moon to help you see your way for if it was dark, wild and windy your candle would get blown out. No wonder people used the potty under the bed – the ‘gazunda’. But even so a candle in a glass case was still needed on occasion and that’s what we are looking at today. We have this rather elegant lantern hanging above the range in our kitchen. Sadly, as the photo shows, one of its glasses is cracked, but that hardly mattered for it still gave illumination and the candle flame was still protected from the ravages of the weather. This item is Victorian – nineteenth century and came from a White Street house. Similar items could have been found in most households. The observant will notice that, as well as having the handle for carrying or hanging the lamp, the base has four feet formed in it. This lantern was equally adept at standing on a surface. What a delightful lamp it is.